HomeInitiativesSystem of CareWhat is a System of Care? Adapted from: Stroul, B., Dodge, J., Goldman, S., Rider, F., & Friedman, R. (2015). Toolkit for Expanding the System of Care Approach. Washington, DC: Georgetown University Center for Child and Human Development, National Technical Assistance Center for Children’s Mental Health. Stark County’s children, youth and families with or at risk for mental health or other challenges and their families, will experience a coordinated, accessible, youth- and family-driven, culturally and linguistically competent, trauma-informed and evidence-informed continuum of care that supports them in reaching their maximum potential in their homes, schools, community and into their adult life. Stark County’s youth and families will experience a welcoming and coordinated network of care that: is available to them when they need it; values and responds to their voice and choice; and guides them to the services and supports needed to succeed in their homes, schools and community. The following are the goals from the System of Care Funded Proposal, listed in no particular order of importance. Stark County Mental Health & Addiction Recovery (StarkMHAR) is pleased to announce the Substance Abuse and Mental Health Services Administration (SAMHSA) awarded StarkMHAR a four-year System of Care (SOC) Expansion and Sustainability Cooperative Agreement valued at a total of $4 million. The purpose of the grant is to improve behavioral health outcomes for children and youth from birth to age 21 with serious emotional disturbances (SED) and their families. This youth-guided and family-driven program will support the wide scale operation, expansion and integration of the system of care approach by creating a sustainable framework as well as services that continue to meet trauma-informed and culturally and linguistically competent standards of care. “Family-driven” and “youth-guided” mean the strengths and needs of the child and family determine the types and mix of services and supports provided. “Community-based” means the central source of services (as well as system management) rests within a supportive and adaptive framework of structures, processes and relationships, all at the community level. “Culturally and linguistically competent” means agencies, programs and services reflect the cultural, racial, ethnic and linguistic differences of the populations they serve in order to help connect people with appropriate services and supports. 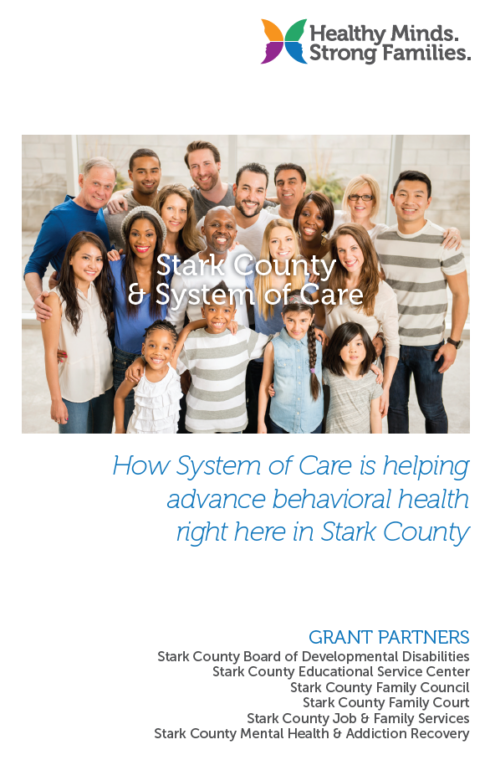 For more information on Stark County’s System of Care, please contact Donna Edwards, Program Administrator, at 330-430-3981 or Donna.Edwards@StarkMHAR.org. For training questions, please contact Carrie Long, Training Coordinator, at 330-455-6644 or Carrie.Long@StarkMHAR.org.